Dr. Michael L. Thornton provides a wide variety of cosmetic surgery procedures for his male clients, including, Nonsurgical PRP Hair Restoration, blepharoplasty for men / eyelid lift surgery, male face lift and direct neck lift, male facial fat grafting, jawline sculpting and neck liposuction, BOTOX® for men, dermal fillers for men, earlobe reshaping / gauge hole closure, Co2 / Erbium laser skin resurfacing, male liposuction & body contouring, after weight loss skin removal surgery specific for men, gynecomastia male breast reduction, and male hernia repair. Men are just as vain about their looks as women. Our society is more accepting male attractiveness and vitality, like recent interests in testosterone replacement therapy, male fitness, and skin care for men. Latest refinements in surgical techniques and technology are allowing cosmetic surgeons to specifically treat men and men-related problems. For example, we have seen a progressive up-tick in men seeking BOTOX® injections to soften their forehead wrinkles and crow’s feet around their eyes. However, it’s more than just BOTOX® (Bro-Tox) for men, as Dr. Thornton is increasingly performing cosmetic surgery procedures specifically on men. 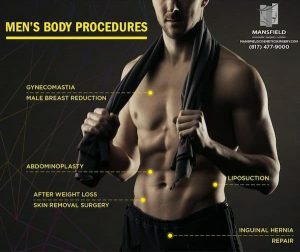 The most popular cosmetic surgery procedure performed at Mansfield Cosmetic Surgery Center is gynecomastia or male breast reduction. This condition is routinely treated with combination liposuction of the breast fat and/or surgical removal of the sub-areolar glandular tissue. The second most commonly performed procedure on men is liposuction of the abdomen and love handles (flanks) to remove stubborn fat deposits. Finally, removal of skin excess from the chest and abdomen following successful bariatric surgery or following massive weight loss is the third most commonly performed procedure. With regard to male facial rejuvenation, Dr. Thornton frequently performs male blepharoplasty (eyelid rejuvenation) to remove skin excess from the upper eyelids and fat pockets from the lower eyelids and usually combined with CO2 laser resurfacing to tighten the lower orbital skin and create a vibrant appearance. Neck lifts and male face lifts are also regularly requested by men who present with “turkey necks”. Tap into the power of nonsurgical PRP Hair Restoration. Discover our nonsurgical options for male androgenic alopecia. What can I expect during my Male Cosmetic Surgery consultation? 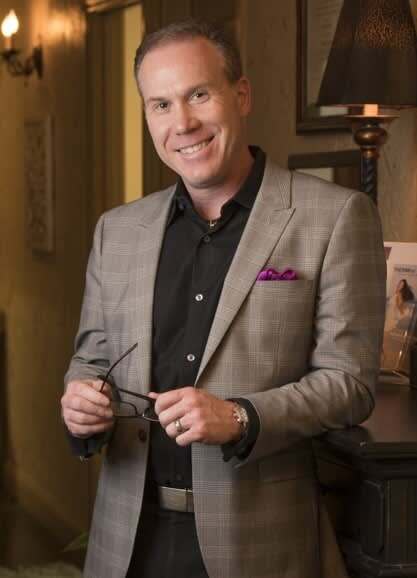 During your consultation, you will meet privately with Dr. Michael Thornton where you will collectively share in the decision making process about your personal needs, desires, and expectations. Although well qualified, we choose not use patient coordinators, nurse practitioners, or physicians assistants to perform your consultation so Dr. Thornton will exclusively perform your examination and provide you with surgical options as based upon your desires and expectations. Minor procedures may be performed in our private operating room with local anesthesia and oral sedation. However, if more complex or prolonged procedures are required, your surgery will be performed at Baylor Surgicare at Mansfield, a JCAHO and AAAHC certified out-patient surgery center, located in Mansfield, Texas.